The Atlanta Braves visit Nationals Park on Saturday, July 8, 2017 to play the Washington Nationals. The probable starters are Julio Teheran for the Braves and Stephen Strasburg for the Nationals. The opening line for this matchup has Atlanta at +170 and Washington at -200. The Braves have a 43-38-3 over/under record and a 44-40-0 run line mark. The Nationals are 42-43-0 against the run line and have a 42-39-4 over/under record. The Braves have a 41-43 overall record this season. Starting pitcher Julio Teheran has a 6-6 record with an earned run average of 5.14 and a WHIP of 1.42. He has 70 strikeouts over his 96.1 innings pitched and he's given up 99 hits. He allows 9.2 hits per 9 innings and he has a FIP of 5.71. The bullpen has an earned run average of 4.27 and they have given up 249 base hits on the year. Teams are hitting .236 against the bullpen and they've struck out 260 hitters and walked 110 batters. As a team, Atlanta allows 9 hits per nine innings while striking out 7.3 batters per nine innings. They are 24th in the league in team earned run average at 4.71. The Braves pitchers collectively have given up 749 base hits and 391 earned runs. They have allowed 110 home runs this season, ranking them 10th in the league. Atlanta as a pitching staff has walked 287 batters and struck out 606. They have walked 3.5 men per 9 innings while striking out 7.3 per 9. They have a team WHIP of 1.39 and their FIP as a unit is 4.72. As a team Atlanta is hitting .262, good for 8th in the league. The Braves hold a .406 team slugging percentage and an on-base percentage of .325, which is good for 17th in baseball. They rank 7th in MLB with 9.1 hits per game. Ender Inciarte is hitting .305 with an on-base percentage of .350. He has 108 hits this season in 354 at bats with 34 runs batted in. He has a slugging percentage of .410 and an OPS+ of 99. Nick Markakis is hitting .285 this year and he has an on-base percentage of .363. He has totaled 90 hits and he has driven in 42 men in 316 at bats. His OPS+ is 97 while his slugging percentage is at .383. The Braves have 754 hits, including 150 doubles and 82 home runs. Atlanta has walked 234 times so far this season and they have struck out 623 times as a unit. They have left 563 men on base and have a team OPS of .731. They score 4.55 runs per contest and have scored a total of 378 runs this year. Washington has a 50-35 overall mark this year. With an earned run average of 3.28, Stephen Strasburg has a 9-2 record and a 1.08 WHIP. He has 128 strikeouts over the 109.2 innings he's pitched. He's also given up 87 hits. He allows 7.1 hits per nine innings and his FIP stands at 3.08. The bullpen has an earned run average of 5.20 and they have given up 256 base hits on the year. Teams are hitting .275 against the Nationals bullpen. Their relievers have struck out 217 batters and walked 81 opposing hitters. As a team, Washington allows 8.4 hits per nine innings while striking out 9.1 batters per nine innings. They are 9th in the league in team earned run average at 4.09. The Nationals pitchers as a team have surrendered 702 base knocks and 342 earned runs this season. They have given up 107 home runs this year, which ranks 12th in Major League Baseball. Washington as a staff has walked 250 hitters and struck out 760 batters. They give up a walk 3 times per 9 innings while they strike out 9.1 per 9. Their team WHIP is 1.27 while their FIP as a staff is 4.11. As a team, they are batting .277, good for 2nd in the league. The Nationals hold a .471 team slugging percentage and an on-base percentage of .345, which is good for 3rd in baseball. They rank 2nd in MLB with 9.7 hits per contest. Ryan Zimmerman comes into this matchup batting .330 with an OBP of .373. He has 93 hits this year along with 62 RBI in 282 AB's. He maintains a slugging percentage of .610 with an OPS+ of 150. Bryce Harper is hitting .324 this season and he has an OBP of .431. He has collected 94 hits in 290 at bats while driving in 64 runs. He has an OPS+ of 165 and a slugging percentage of .600. The Nationals as a unit have 817 base hits, including 172 doubles and 124 homers. Washington has walked 304 times this year and they have struck out on 647 occasions. They have had 599 men left on base and have an OPS of .816. They have scored 5.58 runs per game and totaled 469 runs this season. 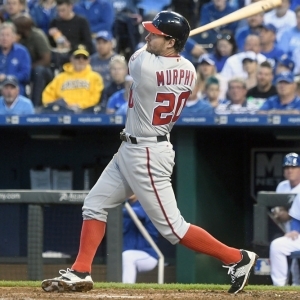 Who will win tonight's Braves/Nationals MLB game against the spread?